Creating an irresistible summer oasis is a key element to enjoying all summer has to offer when it comes to your outdoor space. Having the best outdoor gadgets can turn an ordinary patio into a fun and exciting place you’ll want to spend the majority of your time! Here are some ideas for the best outdoor gadgets for your patio space that will have your neighbors, friends, and family begging for an invite. With the addition of outdoor smart devices, a patio can become more of an indoor-outdoor living area than ever before. Virtual assistants such as Amazon Echo and Google Home are devices capable of voice interaction, music playback, making to-do lists, setting alarms, streaming podcasts, playing audiobooks, and providing weather, traffic, sports, and other real-time information. Having these devices connected to your outdoor speakers is a great way to add an element of technology to your outdoor space and for entertaining the technologically savvy guests that drop by for some patio fun. What’s better than cozying up on a warm summer night and watching a movie? Doing it outside! Now you can have the comforts of a movie theater in your own backyard. You can make this as simple as purchasing a moderately priced projector ($100- $300) and setting up a DIY screen with a white sheet and an open space. Or, if you are looking for top of the line, there are complete outdoor home theater systems you can purchase ($1000- $4000). Whatever the cost, this is a great way to make a night in your outdoor space memorable. Lights are a great way to make the summer nights last just a little longer. Solar lights create a welcoming ambiance but keep the cost low. 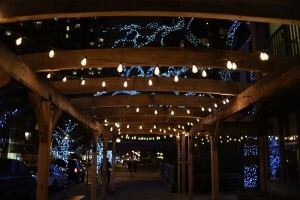 Solar lights come in an array of different styles whether it is the popular LED fairy lights, or landscaping lights to light paths and walkways. The cost varies on your decor and how much light will be appropriate for your area. Gone are the days of half-grilled steaks after you realize you have run out of propane. With this cool gadget an app can inform you when your propane is low and in need of refilling. It works with all grills with non-hanging propane tanks. As long as your propane tank is in close proximity to a Wi-Fi signal and you have the downloadable app on your smart device you will never run low on grilling power. With technology at an all-time high, there are so many ways you can have a fun, gadget-friendly patio. Impress your friends and neighbors with all the best outdoor gadgets that make your patio the hip place to be this summer.